The Atlanta Botanical Garden is filled with more than flowers, plants, and trees. There is an absolutely incredible collection of art throughout the Garden. And it's placed in such a way that makes the discovery process great fun. 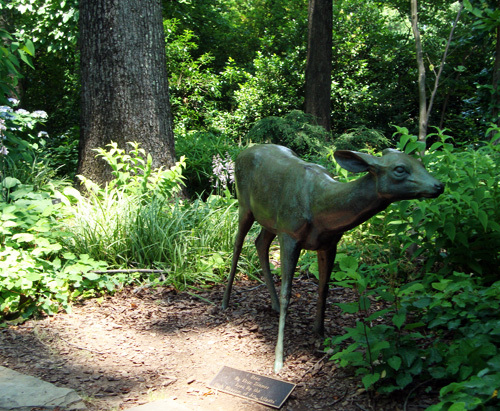 One of my favorite pieces is "Deer" by Fritz Paul Zimmer, an artist and sculptor from Germany. Deer is on an extended loan from Atlanta's High Museum of Art. "Discovered" while exploring the Southern Seasons Garden, very near the Hardin Visitors Center, Deer is a endearing find (and a great photo-op). This particular garden focuses on local plants and features plants and flowers that bloom every season of the year. It's particularly beautiful in the spring, but a must-see througout the year.